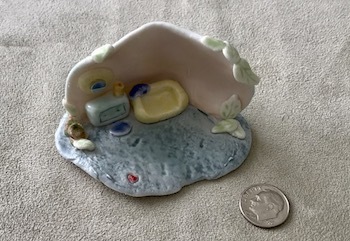 Joan Wheatley's Miniature Treehouses, Wee Animal Display Cases, Hand-sculpted porcelain clay mice; Folk Art-painted and Dollhouse accessories. Along with my Hindeloopen miniature furniture (a folk art dating back to 1700. 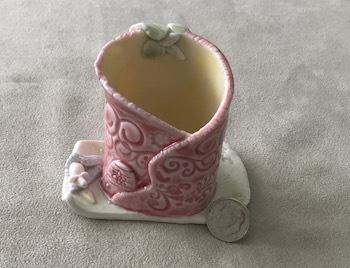 This is similar to Norwegian Rosemaling), whimsical treehouses and collector cases, I now make miniature ceramic clay mice and other animals. These are not to scale but most will look good in a 1/4" scene or treehouse. The treehouses and cases seem to be perfect for the wee forest animals, miniature dolls and fairies. Maybe you have some animals looking for a cozy little home. If you have any questions regarding any of my pieces or would like a special piece created for you, please contact me. Thanks for stopping by. You can also find me on Facebook and Instagram at Joan Wheatley's Creations.